Put your company logo on our wide selection of logo golf folding chairs for your next golf tournament, event, outing or promotion. 4. Your folding chairs will be produced and shipped followed by a tracking number sent by email. Custom Logo Folding Tripod Stool With Carrying Bag. Made Of 600D Nylon. 210D Nylon Carrying Bag With Shoulder Strap And Drawstring Closure. Steel Tubular Frame - Weight Limit 250 lbs. 11" W x 11" H.. Custom Logo Game Day Seat Cushion. 1"-thick foam interior. Light weight with handle to make the seat easily transportable. Flap down organizational panel with compartments for holding a water bottle, program, blanket and all other game day essentials..
Made Of 600D Nylon. Two Mesh Cup Holders. 600D Nylon Carrying Bag With Shoulder Strap And Drawstring. Steel Tubular Frame - Weight Limit 300 lbs. 32" W x 34" H x 20" D.. This affordable and versatile chair is a great gift item for everyone! Its comfortable seat holds up to 275 lbs. with an insulated cooler below. A must-have item for ball games, fishing, camping, parades, and all your outdoor activities. Don't miss out on.. Custom Logo Golf Folding Cooler Chair. This item is a chair and cooler with one main zipper compartment that holds up to 40 cans and a small front pocket. It folds back down for easy carry. .. Custom Logo Koozie Chair Cooler. Be the envy of the crowd! The Kooler Chair is perfect for the beach, a picnic or any sporting event, as it consolidates refreshment and relaxation needs into one great item. Tubular steel folding frame that holds up t.. Custom Logo Mesh Camping Chair. 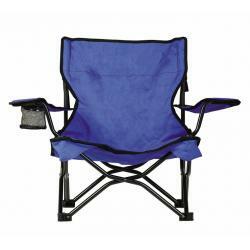 Take this lightweight and durable chair with you next time you go camping or tailgating with friends. The breathable mesh fabric will keep you cool and comfortable during any outdoor event. Folds up and fits into a con.. Custom Logo Remington 24 Can Cooler Backpack Chair. This 24 can capacity cooler has an integrated folding chair. It is made of durable 600D material and features a zippered main compartment with PEVA lining, adjustable padded shoulder straps, zippere.. This seat is as tiny as it is tough! The Ultimate Slacker Portable Stool has three legs and a back rest able to support 275 pounds! When closed and secured with its integrated Velcro strap. Perfect for price point promotions requiring a high value item. T..